During the first year with a new baby, parents can face a lot of things: first smile, teething, first words, and maybe the biggest event which draws a line between babyhood and toddler age is making the first steps independently. There are some phases, however, which the baby needs to pass in order to reach that momentous milestone. Since every child is different from another, this magical moment can come earlier in some, and in other children a bit later. The most important thing is to wait for it to happen naturally, without pushing your baby too hard, and yet helping it gradually build muscle tone, balance and strength. Most parents ask themselves: when is it normal for my baby to take their first steps? How can I help my baby start walking? Here are the answers to your questions. Almost every child has its own story. Especially when it comes to walking, you never know when it can happen. During their first twelve months, babies are practically unable to do almost anything by themselves. What they gradually develop is muscle strength and coordination of their body parts. First they will learn how to sit and roll over when they are about six months old, and crawling will be the crossing point between sitting and walking. In some children, walking can occur sometime between nine to twelve months of age, whereas in other it can be perfectly normal if it occurs when they are fourteen to fifteen months old. 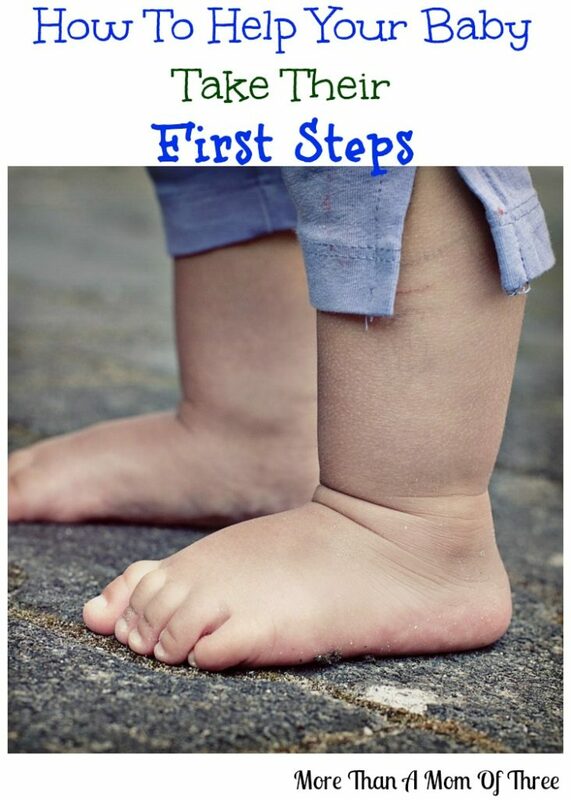 You need not worry if your child does not make its first steps during the first year, or the first sixteen months; what you can do is encourage them gently. Sometimes, with some children, walking can come naturally – one day they are rolling off the couch, the next day they are making their first steps in the kitchen, and on the following day they are running off to college. First steps can be made in walkers and jumpers, which serve for your child to develop muscle tone, hips and balance. However, real, independent steps you can encourage by letting your baby walk behind a big exercise ball, which you would roll slowly across the floor. They can also try walking while holding onto furniture for support. You can hold a broomstick vertically and let your baby hold it while making its first steps. Pushing toys while standing can also be a great exercise; do not forget to dress your baby in overalls and gently hold their back as it walks and pushes toys. You should not put shoes on their feet until they learn to feel the floor’s surface. Day by day, their balance will improve, and them standing in an upright position will be an ordinary thing you see. As it was previously said, mastering the standing position comes naturally and can be different with every child. If your baby develops quickly, then walking will come earlier too. Your child can be an ‘expert’ in walking at eighteen months, but if it does not start walking or even stand steadily by two years of age, you must visit the doctor’s. Especially if you notice your child is limping while you are helping it walk alone, you should take it to see your pediatrician, and even children’s podiatry specialist because your baby may have some foot problems. As excited as a parent can be about your baby having their first steps toward independence, try to be patient and encouraging, provide a safe environment and wait for your baby’s perfect timing for this milestone. Soon enough, you will enjoy the happy pitter-patter of their little feet thumping all over your home. Awe, thinking about my son’s first steps make me so happy! I am trying to conceive and hope to get the experience again. Thinking back when my son starting walking, he was so ready but his little legs weren’t. Being premature it did take him a bit longer than others . But he’s running now !!! Our 3rd child (of 5 kids) was the earliest walker (he walked at 10 months). All my other kids walked at 12 months or beyond. I think that the difference with him, was that we “walked” him around the house endlessly and he gained muscle strength as a result. Awe, great tips! My one twins had the hardest time in learning to take those steps. her sister was cruising by the time she got up and went. In this case though, she wanted to follow her sister. lol.